In some instances, you may want to add to the story of a piece of jewelry or other small product by incorporating an environment around it. This style of shooting helps to give viewers an idea of who would be wearing a particular item, what time of year, holiday, or occasion it’s intended for, or to give a sense of place to an image. 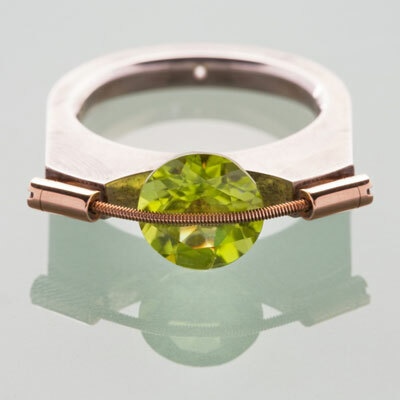 If a plain white background helps to say, “This is what our particular ring looks like,” then a natural setting helps to say, “This is where our particular ring belongs.” By placing a piece of glass on a tabletop studio setup, you can add the subject’s reflection to your composition, like in this photograph. A women’s necklace might be best represented in an environment made up of feminine colors (such as pastels). A young girls’ necklace, which is meant to appear more hip than elegant, might be more appropriately photographed among bold colors. 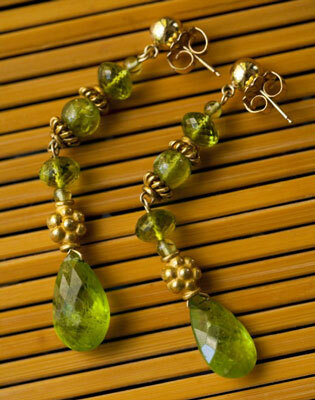 A handmade piece of jewelry made from recycled silverware could be shot in the presence of natural or earthy colors. Each situation requires you as the photographer to determine what type of colors best suit your subject. Props provide supporting details in a photograph that tell viewers about the subject. These can consist of any element with literal or symbolic meaning. Positioning a diamond ring in a box of chocolates suggests that it’s a good gift idea for Valentine’s Day. Textures can give a sense of place to a piece of jewelry (or similar subject), while still providing a background simple enough that it won’t distract from the details of the subject. For example, a sandy surface reminds viewers of the beach, wood grain provides a rustic setting, stone is harsh, and fabric can be comforting. In this photo, color and texture are important in the background. The muted orange color of the wood surface works well to bring out the color of the green stones without causing the image to be too loud (visually) for this particular subject. The texture of the surface works to give a sense of place to the earrings but isn’t so distracting as to steal attention from them.